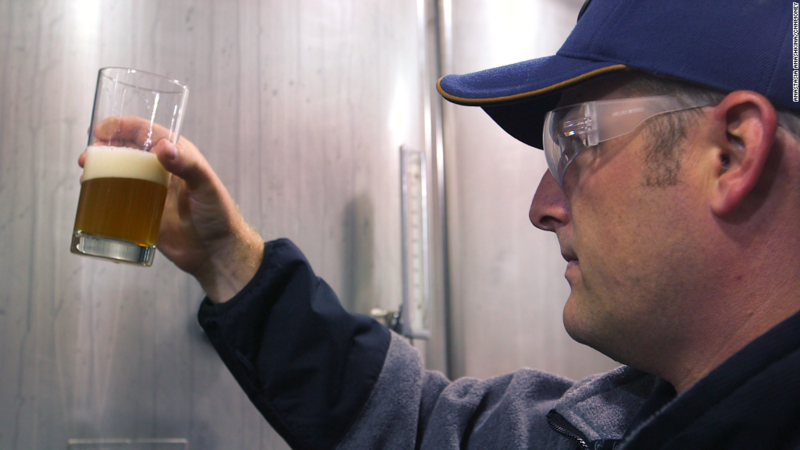 All Anheuser-Busch InBev wants for Christmas is a craft brewery. Or two. Heck, make that three. The self-proclaimed King of Beers has gone on a shopping spree in the past week, scooping up Arizona's Four Peaks Brewing Company last Friday, the U.K.'s Camden Town Brewery on Monday and Colorado's Breckenridge Brewery on Tuesday. Once those deals are done, Anhueser-Busch InBev (BUD) will own eight craft breweries. It bought Goose Island back in 2011 and followed that up with the purchases of Blue Point and 10 Barrel last year and Elysian and Golden Road Brewing earlier this year. The company also owns a nearly 32% stake in publicly traded Craft Brew Alliance (BREW), the parent company of Widmer Brothers Brewing, Redhook Ale Brewery and Kona Brewing Company. It makes sense that the owner of big name beers like Budweiser, Bud Light, China's Harbin and Brazil's Skol and Brahma is embracing the microbrew movement. Sales of craft beers are booming, particularly in the United States. Meanwhile, sales of Bud and Bud Light have been stagnant. AB InBev clearly realizes it must do more to woo Millennial drinkers. It even just unveiled a new look for Bud Light cans and bottles, one that is more modern and edgy. But the flurry of deals comes at a curious time for AB InBev -- and not just because they are happening during the usually sleepy last few weeks of the year. AB InBev is in the process of trying to convince regulators around the world that it should be allowed to buy its rival SABMiller (SBMRF). The deal will create a beer behemoth and is expected to face intense scrutiny from antitrust watchdogs. In fact, the two companies have already agreed to sell some assets to ensure the merger goes through. SABMiller plans to sell its majority stake in U.S. joint venture MillerCoors to Molson Coors (TAP) for about $12 billion. That will give Molson Coors full ownership of Miller Lite and Miller High Life in the U.S. and the rights to those and other Miller brands internationally. AB InBev has also said it will look for someone to buy SABMiller's Peroni and Grolsch brands as well as Meantime, a U.K.-based craft brewer that SABMiller just bought in May. So it could be a problem that AB InBev and SABMiller are looking to unload some brands while simultaneously going on a bit of a craft brew bender. Many fans of independent brewers are also not happy to see that Big Corporate Beer is purchasing a lot of cool, trendy microbrews. It doesn't help that AB InBev's Budweiser brand ran an ad during this year's Super Bowl that mocked craft breweries. The commercial -- called "Brewed The Hard Way" -- touted Bud's "macro beer" roots. It showed a dude with a handlebar moustache and beard sniffing a beer like it was a glass of wine. The text to go with it? "It's not brewed to be fussed over." The ad also featured the following line: "Let them sip their pumpkin peach ale, we'll be brewing us some golden suds." The spot seemed hypocritical to many beer drinkers, especially since it came just after AB InBev bought Elysian -- which makes four pumpkin brews. So AB InBev may need to revamp its ad campaign. It can't pretend to be just about brewing beer for the masses and turn its nose at all those hipster craft brews while it's busy buying many of them. It also may need to slow down the pace of its craft beer acquisitions. Unless regulators drink one too many cold ones and analyze the deal with beer goggles, they may give the SABMiller deal an even tougher review if AB InBev starts looking like the King of Microbrews too.